"History is about to be rewritten by two guys who can't spell." Bill Preston and Theodore Logan were just average California teen musicians worried about passing World History until they met a man from the future named Rufus in a parking lot, who changed everything. After Ted is threatened by his father about going to Alaska if he doesn't pass, Rufus arrives in a phone booth to warn them that future society will be ruined if they don't pass because they won't be able to affect people with their music. After their future selves show up minutes later, Rufus tells them that the phone booth is indeed a time machine. He takes them back in time to witness Napoleon Bonaparte leading the war against Austria in 1805. Upon their departure, Napoleon gets accidentally thrown in with them when they go back to present time. It is then that they get a wild idea. They start punching in dates on the phone, fetching as many people from time as possible, including Billy the Kid, Joan of Arc, Genghis Khan, Sigmund Freud, Abraham Lincoln, and even Socrates from 5th century B.C. After they repair a short malfunction, they return to California to give the best book report of all time and save the future. 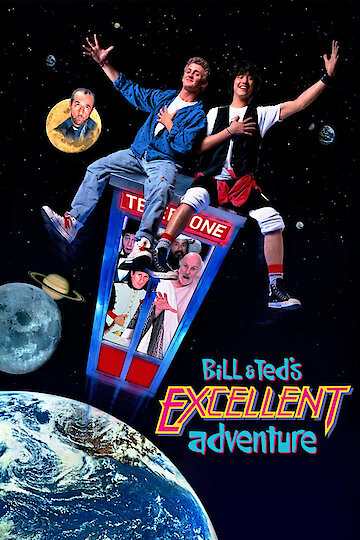 Bill & Ted's Excellent Adventure is currently available to watch free on Tubi TV, Pluto TV and stream, download, buy on demand at Amazon Prime, Amazon, Vudu, Google Play, FandangoNow, iTunes, YouTube VOD online. Bill S. Preston, Esp. and "Ted" Theodore Logan had one simple thing to do: write the greatest song ever. More than 20 years later, the future is still waiting. According to Keanu Reeves, that's where the next "Excellent Adventure" of Bill & Ted takes off into an impressively sensible direction.